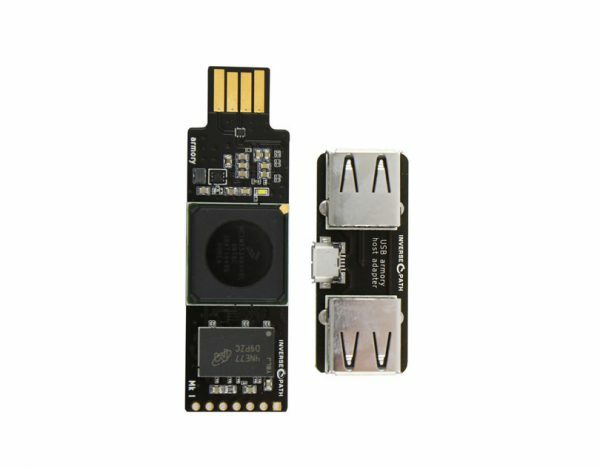 The USB armory is a discreet, flash-drive sized computer that’s secure, open source, and ideal for developing and running a range of applications. Developers and ordinary users alike benefit from this device’s quick NXP i.MX53 processor, advanced security features like secure boot and ARM® TrustZone® integration, fully customizable operating environment, exceptional native support and much more. With the USB armory’s secure System on a Chip (SoC) features, and open design, this device provides developers and users with a reliable platform for building and executing personal security applications, storing and automatically encrypting data, managing digital keys and passwords, and performing a variety of other security-oriented tasks. The USB armory can even be used to securely access remote computers (over a VPN or SSH), act as an electronic wallet (for Bitcoin), or serve as a bridge for Tor. Notes: You will need to supply your own microSD card. The cap is no longer included as it was always loose or too tight – never quite the perfect fit.